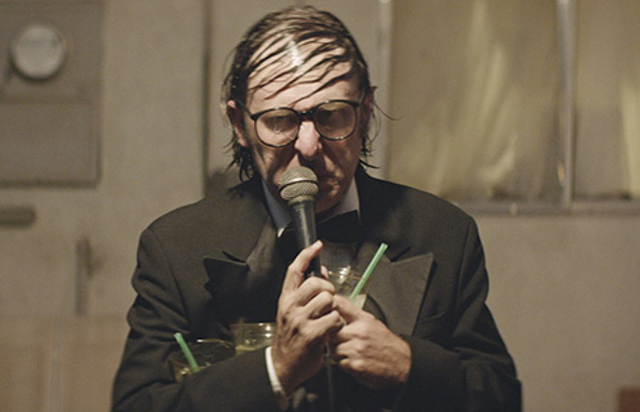 Rick Alverson is from Richmond, Virginia, and has had a varied career directing music videos, as well as being a musician himself. His feature directorial debut was “The Builder” (2010), followed by “New Jerusalem” (2011) and the festival favorite “The Comedy” (2012). “Entertainment” is an expression of a radical voice, one that challenges the conventions of storytelling and character. Rick Alverson spoke to HollywoodChicago.com via phone about his expression. HollywoodChicago.com: One of the best realities of the film is that the America that exists within it is as authentic as any other America, if not more. Which part of America in the film was your favorite element to both write and shoot? Rick Alverson: The whole thing I believe is a disruption of the American utopia, the beautiful failure of that notion based on the real facts on the ground and that has a worthwhile shape, but is often ignored. For me, it’s a lot about having been swamped all my life with the idea of the unlimited potential and resources of the American Dream. Not only is this untrue, but it’s an injustice to those people who don’t have access to this utopia. HollywoodChicago.com: There are characters with names, and then they are the wanderers who go only go by their character descriptions…The Comedian, The Chromotherapist, The Celebrity. What sets these characters apart from giving them further identities or names, in the context of what the film offered? Alverson: That stems from my general disinterest of narrative content. This idea of backstory, that these characters could exist outside of the film, is part of the problem. We’re in a content obsessed culture, and that creates a lack of interest in form. We’ve become conditioned to look through the event that is happening, more towards something that is trying to be sold, whether it’s a dream or a product. It’s my pathetic attempt, in a Brechtian way, to show my disinterest in this fantasy. HollywoodChicago.com: The Comedian draws laughs only once, and very early in the film. What do you think is the state of audiences today, in the way that they absorb an ‘act’ in the age of social media narcissism? Alverson: There is a frightening component that this film explores, about how we have the capacity to create our own hell, and how we cannot escape our own inherent identity. Increasingly, the media we surround ourselves with allows us to manufacture our own experience every day, which is a perception of the world that is our own invention entirely, whether it is on social media or what we choose to absorb. This was very different when I was a kid, like generations before us we were exposed to things that were not entirely on our terms. We had to wrestle with and find the relationship with the world around you. It was literal experience, unlike the form of protracted psychic masturbation that is the digital world we live in. HollywoodChicago.com: The very nature of comedy is put to task in what you’re representing in The Comedian. Did you intend for his act to be about paying attention to him or dismissing him, as to create an air of superiority from his audience? Alverson: The character is trapped in feedback loop regarding this particular exchange of the exaggerated identity of his act, and his search for real identity. This is tragic and complex, and it’s complexity is rooted as a byproduct of a bygone age where form mattered. The Comedian wasn’t entirely and immediately disposable. HollywoodChicago.com: John C. Reilly brings a specificity to John that seems to represent an emotional disconnect, which the landscape around him almost deserves. How did you collaborate with him to render such a telling expression in that soul? Alverson: John is so seasoned, and a gifted and innate performer. He has such a big personality, and he does his own work. I set him loose, developing and articulating the edges of the scene in what I was trying to achieve. John and Gregg Turkington [The Comedian] are friends, and I knew their chemistry, and I knew how that would be manifest or useful to them. Like my last film, ‘The Comedy,’ I rely on these chemistries, and the casting provides what I’m looking for, because I don’t use traditionally scripted dialogue. I don’t have an interest in the dialogue driving the narrative, I’m more interested in it being oblique and tangential, and even fail at times. I write tradition scripts, but not traditionally scripted dialogue. The outlines contain tone and content, if necessary, but mostly it’s a thematic kind of intent. If the casting is done properly, I just set them loose. HollywoodChicago.com: Tim Heidecker is one of the greatest surrealists in the comedy biz today. What did he add to ‘Entertainment’ that is prevalent in the film? Alverson: He’s a steward of all of my collaborations with the comedy world, because I exist outside of that world. It as he, Gregg and I that did the initial outline of the film, and Tim really wanted to see it happen. It wouldn’t have been the same if he wasn’t involved in it. HollywoodChicago.com: The art of cinema can work on so many levels of reality and fantasy, and you’re really playing with all the potential of filmmaking in ‘Entertainment.’ What is fun about doing a creative collaboration in the type of vision that you put forth? Alverson: It’s remarkable to have all these kind and generous people helping to realize my obsessions and vision, and facilitate it. It’s humbling. HollywoodChicago.com: The goal for The Comedian is a connection to his daughter. What do you think it says about all of our connections, are they all ultimately elusive in our attempts to make them? Alverson: Idealism is a fuel for living, and there is an absolute efficiency about how it motivates and propels us. I think there is a tragedy at work there, when we neglect the world around us. There is so much in the form of the film that is a lament about the increasing loss of the tactile nature of experience – paying attention to the shape of the world rather than a fantasy of what it might be. HollywoodChicago.com: If the universe of The Comedian is continuing in your mind, or the mind of your collaborators, where is he tonight and what is he doing? Alverson: [Laughs] To answer that would be a contradiction to my ‘pulling the rug out’ in calling him ‘The Comedian.’ That character exists in the confines of the film, and that film begins and ends.